WILL WRITING SERVICES in 2018 - Our TOP TIPS on who to choose! Although writing a will can be pretty straightforward, it’s often a complicated process for people who have multiple assets and several family members they’d like to benefit from their estate. Even if your situation is relatively straightforward, you want to make sure that your will is watertight and will deliver on your wishes after you’re gone. If so, we can help you create one online in 20 minutes. Just click the button below to see how. Many people understand how important it is to have a will in place – but an alarming number don’t yet have one in place, and haven’t put their wishes down in writing. Mostly people put it off because they see it as something to address when they are older, or they know they need to sort it out but then forget about it. According to charity Will Aid, over 53% of people in the UK do not yet have a will in place. When you die without making a will you die ‘intestate’. When this occurs an individual’s assets are distributed according to a set of rules called Intestacy Rules. This is a set legal order which decides where your money goes – and the result may not reflect your wishes. This can understandably be very upsetting for those left behind – especially if the results appear to be unfair or are significantly different to what you would have wanted. For example, under Intestacy Rules assets can be passed to estranged family members and even former spouses. Where there are no surviving family members the situation becomes even more complicated. Unless long lost relatives can be located all assets pass to the government. As above, if you do not have a will, it’s likely your assets will be seized by the government when they could have been gifted to loved ones or even your favourite charity. Wills also offer an opportunity to introduce additional clauses such as trust funds to further protect your assets from certain taxes and allocate them to specific family members. As part of this, a will writer may also be able to advise you on approaches you can take to avoid paying inheritance tax. There is a video below that explains some of the benefits of avoiding inheritance tax and the steps you can take. Here is a useful video that explains how you can reduce your inheritance tax bill. Most commonly people write a will because they want to know that their loved ones will be looked after and provided for when they are gone. This however may not happen or could become complex if you die without leaving a will to refer to. As an example let’s use Mrs Bloggs. She has lived with her partner for over twenty years – but they are not married. She has not made a will and dies unexpectedly, so her partner is not legally entitled to any of her assets. Even if you are married or are in civil partnership, dying without a will means your loved ones are less likely to inherit your estate in its entirety. In these cases the amount a spouse is entitled to is restricted and some money may go to individuals you hadn’t planned on including in your will. It’s also important to make sure that your will is complete and correct. It’s not enough to just have a will – it also needs to be fully legal and up to date at all times. For this reason it’s a good idea to enlist professional support from a solicitor or expert with specific experience in this area of law. Here is a short video that we produced on the important of making a will. What do will services involve? Will services offer an important lifeline for anyone who is concerned about leaving a legally binding, watertight will when they are gone. They are usually delivered either by will specialists trained in law, or solicitors specialising in wills. There will be a charge for will services – but the peace of mind they offer is often invaluable. Will services can be conducted face to face, online or via post – so you can choose whichever you are most comfortable with. What are the benefits of using a will writing company? A surprising number of people write their own wills or use a ‘will writing kit’, only to leave behind an unpleasant legal dispute that rages on for months or years between family members. Using a will writing company should protect against this as it ensures that your will is legally binding. Will writing can be a complex process. Perhaps you’re unsure of your wishes – or don’t know what the best options to take may be to protect your estate for the next generation. A will writing company can advise and assist with this. Your will writing company may keep your details on file and remind you when it’s time to review your will. It’s a good idea to review your will on a regular basis to ensure that it is valid and still reflects your wishes. If you leave an old will and don’t update it you may find that it does not comply with current regulations and could leave your estate open to Intestacy Law. A solicitor can safely and securely store your will so that when the time comes it can be retrieved and actioned. Few will writers can do this for you. Solicitors are fully legally qualified and specifically trained in this area of law. Few will writers are legally qualified – instead they receive training for wills and estate planning which allows them to give limited advice. This is fine if you want a swift and straightforward solution – but not ideal should you have more bespoke requirements. Solicitors are also fully regulated, so you’re protected should something go wrong. You can obtain more specific advice from a solicitor in the event of a complex situation, such as multiple divorces, overseas investments, business assets or large estates. 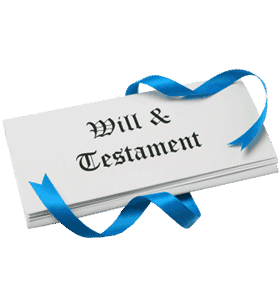 You can choose the solicitor or law firm who draws up your will as your executor. This means they’ll be responsible for executing the will and handling arrangements when you’re gone. Often this is preferable for people who don’t wish to burden family members. There will be an additional cost for this – so make sure you’re clear on charges before you go ahead with it. Using will writing solicitors is sometimes a more costly option compared with will writing companies. The cost can range between £150 for a basic will up to £600 for a complex will. – Shop around for the best price. You may be able to save over £100 by comparing costs. You may also like to wait until Free Wills Month (run twice a year in March and October throughout England and Wales) or Will Aid in November. This enables you to see a solicitor for free – although the charity will strongly encourage a small donation, so its not really free! – Your children: If you have children under the age of 18, you’ll need to think about who will be their legal guardian should you and your partner pass away. – Your Assets: List your assets (everything you own) one by one. This includes property, cars etc. Note down the estimated value of each and remember to include details such as independent or shared ownership. It might be useful to locate documents such as deeds and titles now, as they can be expensive to replace if they get lost. – Your Belongings: Remember to include smaller items in the above list – cherished items you wish to pass on. – Executors: You’ll need to appoint an executor to ensure that the wishes in your will are carried out. Usually people appoint either a close family member or their solicitor to take care of this. It must be someone you know well and trust. Remember it can be a stressful and lengthy process – so they will need to be prepared for it and agree to it. – Beneficiaries: These are the people or organisations who you wish to benefit from your will. Make a list before deciding who will receive what. – Charity: Do you want to leave some money behind to your favourite charity? How much will you leave? – Funeral instructions: You may like to leave your preferred funeral arrangements in your will along with money to pay for it. If you have not thought about paying for your funeral, you can read our article on funeral plans here. Your intentions to be an organ donor can also be included in your will – but you’ll need to be registered too. – Powers of Attorney and related issues: Whilst making a will you can also arrange Lasting Power of Attorney, alongside trusts, advanced directives and more. You can read more about Powers of Attorney on this site.. The two main types of power of attorney that you should be aware about are called a Health and Welfare Power of Attorney or a Property and Financial Affairs Power of Attorney. It is important that you understand what these are and how they work. The process itself may throw up some additional talking points – as you speak with a solicitor, they may advise certain things that you hadn’t considered before, such as trust funds. Where can I go for further information on writing a will? You have two options if you are looking for some help. Option 1 – You can search our directory of will writing professionals, which you can find here. Option 2 – Leave your details below, and we will put you in touch with a will writing professional. This is an option that lots of people prefer as it takes away a hard decision of finding someone reputable to help you.